This easy pico de gallo recipe is the perfect topping for tacos and burritos and makes a great dip for tortilla chips! I happen to love salsa, it’s the ultimate low cal condiment! It’s awesome on tacos, perfect on a piece of grilled chicken and can even be used for dessert! 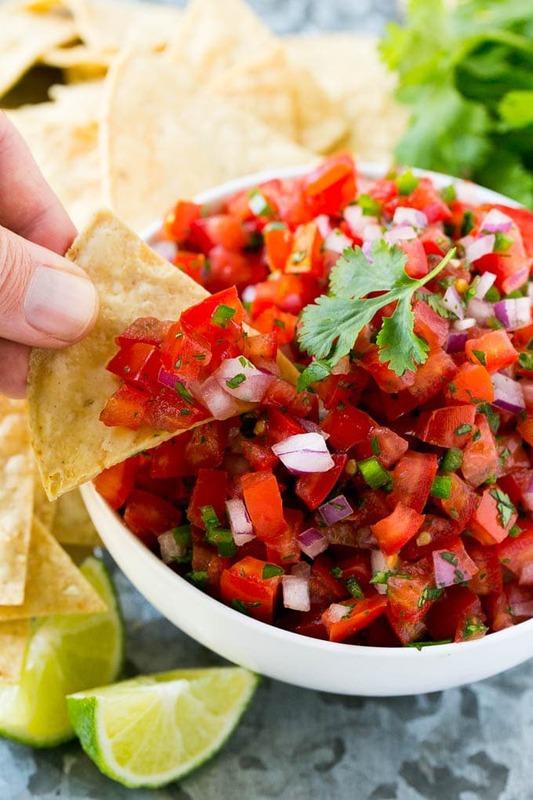 This pico de gallo recipe is a classic that never gets old. It’s fresh, flavorful and oh so easy to make. It also tastes WAY better than any pre-packaged salsa you’ll find at the grocery store. Did you know that a lot of the fresh packed salsas at the grocery store contain preservatives and stabilizers? It’s true. 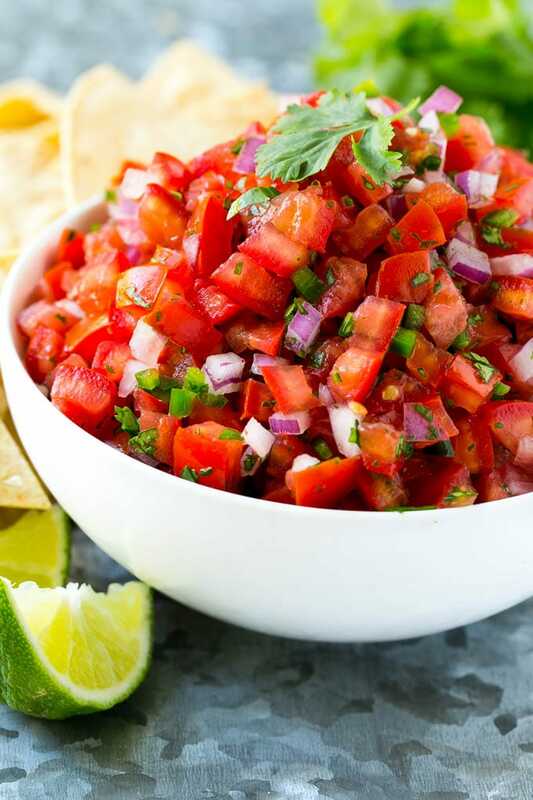 This pico de gallo is simple and fresh ingredients combined together to make an awesome dip or Mexican food condiment. This is a very simple recipe, which means it only tastes as good as the ingredients themselves. 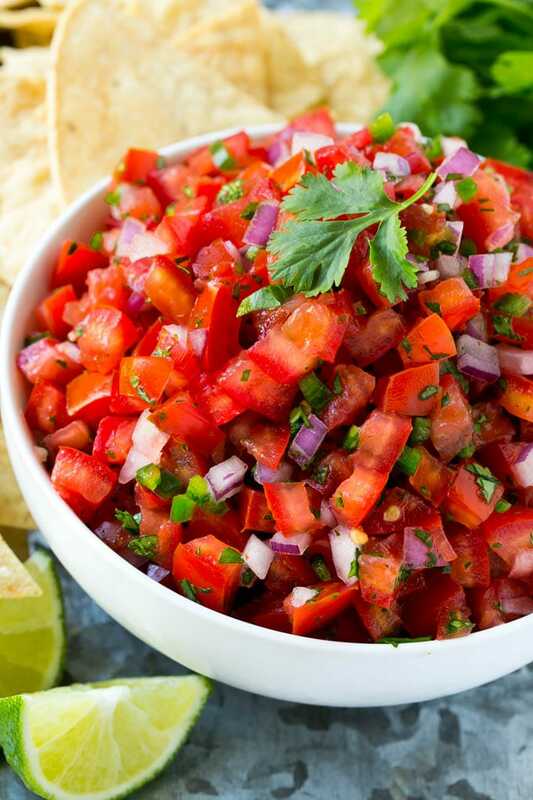 Look for the ripest tomatoes you can find for this pico de gallo for the best results. The hardest part about this recipe is the time it takes to chop up the veggies! 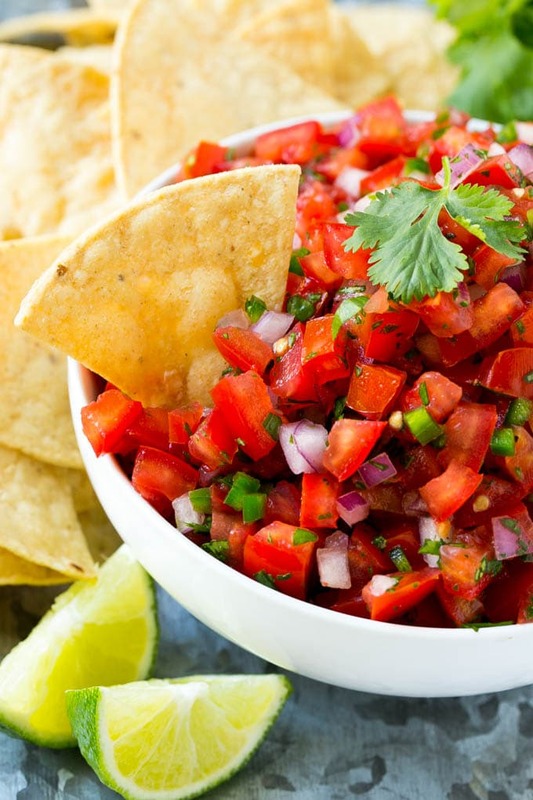 You’ll want to try to cut everything into small, uniform pieces so that the salsa fresca is easy to scoop up with chips. I used red onion here instead of the traditional white onion because it’s sweeter and doesn’t have the harsh flavor that can sometimes come along with other types of onion. The tomatoes and onions are combined with jalapeno, garlic, cilantro, lime juice and salt. This recipe tastes best if it you let it sit for at least 20 minutes before you plan to serve it so that the flavors can come together. This recipe is written for a mild pico de gallo; when you remove the seeds and ribs of the jalapeno as instructed, it loses most of its heat. If you prefer a spicy pico de gallo, you can keep some of the ribs and seeds to get your desired heat level. 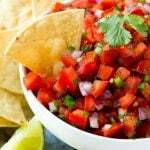 Once you try homemade pico de gallo, you’ll never want to go back to the store bought stuff! Love pico de gallo! My husband loves it on eggs! It’s so cool to make my own pico de gallo. It can’t get any fresher. I like extra cilantro.